I just got my ballot from The Association of Alumni of Dartmouth College asking for me to vote for or against the new Association Constitutional Amendment and for a slate of candidates for this organization … all of whom strongly support this amendment … amazingly, not one single dissenter. From reading the enclosed promotional material, I get the eerie feeling that I am being asked to participate in a sham democratic process that will put another nail in the coffin of true alumni/ae participation in the future of Dartmouth. It’s kind of like when Saddam Hussein used to be “democratically” re-elected in Iraq with 99.9% of the vote. Basically, this amendment appears to me to insure that this association can no longer be dominated by the types that initiated the lawsuit against the college last year that attempted to stop the college’s Trustee board-packing scheme. This is done by making the Association of the Alumni effectively self-perpetuating and for the nomination of dissenters so complex that few will have the stamina to complete it. Therefore, I will vote “no” for this amendment and not vote for any of the candidates proposed by the existing Association. If you don’t see any more posting on this blog in the next twelve months, it would be rational for you to assume that the Wright-thinking PC police have hauled me off to the boarded-up Hovey Grill in the Dining Hall to be re-educated in the ways of a true Liberal education. (1) "I get the eerie feeling that I am being asked to participate in a sham democratic process that will put another nail in the coffin of true alumni/ae participation in the future of Dartmouth." You are mistaken. You and everyone else, including Hanover Institute officers, were free to petition to run in this election or round up a slate of people who would. "It’s kind of like when Saddam Hussein used to be 'democratically' re-elected in Iraq with 99.9% of the vote." No, it is not. 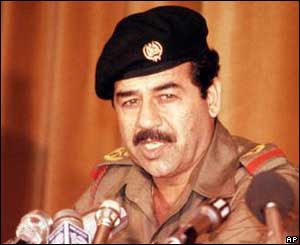 Saddam Hussein's elections did not permit any citizen to run after obtaining a reasonable number of petition signatures. (2) "Basically, this amendment appears to me to insure that this association can no longer be dominated by the types that initiated the lawsuit against the college last year that attempted to stop the college’s Trustee board-packing scheme." It should not appear that way to you. The amendment is supported by John MacGovern and the Hanover Institute and some members of the defeated pro-lawsuit slate. It preserves the existing petition option for trustee nominees that led to Rodgers, Robinson, Zywicki, and Smith. "This is done by making the Association of the Alumni effectively self-perpetuating"
The amendment has nothing to do with AoA officer elections. For your information, the AoA is a different organization from the Board of Trustees. "...the boarded-up Hovey Grill in the Dining Hall to be re-educated in the ways of a true Liberal education." The Hovey Grill is not boarded up. Correction: The Hanover Institute initially supported the amendment but finally decided to take no position on it. Mike Murphy, the defeated candidate for president on the pro-lawsuit slate, said “I personally strongly support the proposed amendment" according to The Dartmouth, which is also the source of the excerpt above.